Most of us know the concept of solitude and the silence, and many of us have even lived extended periods during retreats or in our ways of live in Religious Life. Yet we know that connection with others is essential. Even Jesus, during the most excruciating days of His Life on earth desires to be with those closest to Him, including the one who would betray Him and those who would desert Him out of fear. 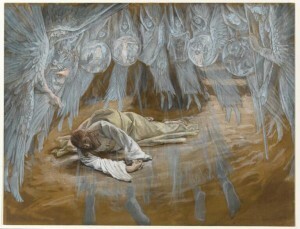 In the Agony in the Garden we see Jesus suffer intense loneliness and desolation. He experiences the pain of our sins and the effects of those sins on our closeness to Him. And then, the disciples to whom He entrusts Himself the most, even they disappoint Him. This intimacy with the Lord is something all of us have sought after, and yet even after being with the Lord in His suffering and our own, we now find ourselves outside of this life of tangible closeness. It is similar to my own familiar feelings of being chosen last for kickball, being left out of conversations and social events, or there being no room at any lunch table for me…those earthly heart-wrenching experiences of not belonging. But it is in this context that we do in fact belong to Jesus. He felt intensely this rejection by the world, by His own friends who were with Him almost until the end, who saw Him cure leprosy and other ailments, raise people from the dead, forgive sins, claim authority over the Temple! No other prophet had done these things! Yet, Jesus was alone in the Garden without a hand on His shoulder or an encouraging word. He may have felt forgotten by His slumbering comrades, bringing back the painful memories of there being no room for Him in the inn, no room in His home town for His preaching, and no room in the hearts of His best friends. Here, we can intimately unite ourselves with Jesus. Although He knew more than anyone the value of being alone with His Father in prayer, He too desired to be with others in His suffering. Whether we’ve left the convent or seminary, or experienced another life change or seeming failure (emphasis on seeming), it is in these very struggles that the Lord dwells. In these moments we are most configured to the suffering Christ as well as united to all of those suffering in the Mystical Body. I hope that you all will be consoled by the truth that our sufferings and our loneliness is not for nothing. Each is an opportunity to choose Jesus as our most intimate friend and place ourselves in that Garden to console Him when no one else had the courage to do so. When I was studying in Rome in college I had to opportunity to visit many Churches. The Basilica of Santa Prassede was one that I will never forget. It was easy to miss given that it was very close to the Major Basilica of Sancta Maria Maggiore, and many other tourist hot spots! But this Church in a busy corner of the Eternal City contains the Pillar where Jesus was scourged. It was amazing to stumble upon this sacred relic upon to which the Sacred Body of Jesus was chained, and upon which His Blood was spattered. 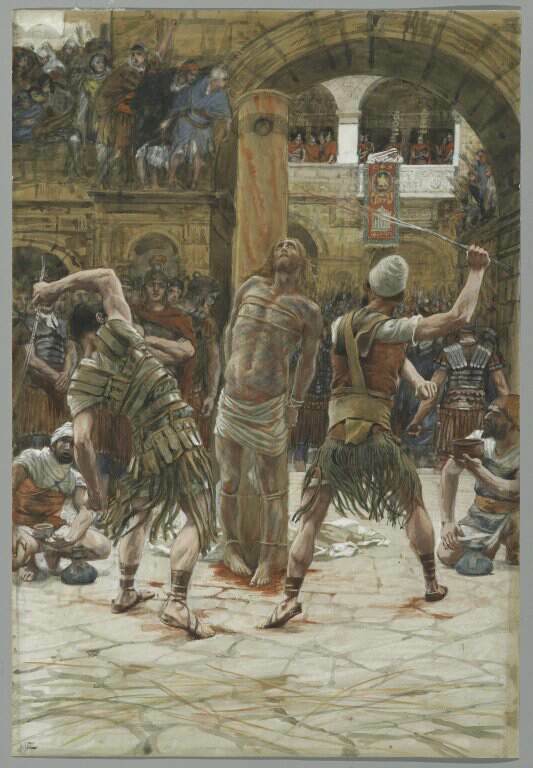 There is little expansion on the Scourging, but we can imagine the gruesome of this Sorrowful Mystery. 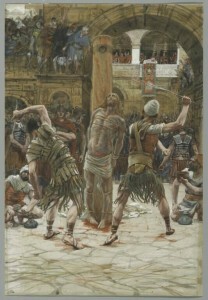 In the Gospel of Matthew, the Jews have just chosen to release Barabbas (a murderer) instead of Jesus, Pilate washes his hands of the Blood of Jesus, and then Jesus was led “like a lamb to the slaughter.” The people cry out, “His blood be upon us and our children.” I don’t think the Jews realized that God would quite literally take them on their word! For, each time we celebrate the Sacrifice of the Mass we take His Body and Blood into us. And counter-intuitively it is this blood that makes us worthy, that sanctifies us and cleanses us of our sins. Many of us have a reaction to the sight of blood, I know I do! But when it comes to the Blood of Jesus, I feel consoled. Why is this? Why don’t I get grossed out like I do in the opening scenes of every crime scene TV show? Well, all I can speak for is myself here, but I think the blood of Jesus strikes us with the reality by which we are saved. 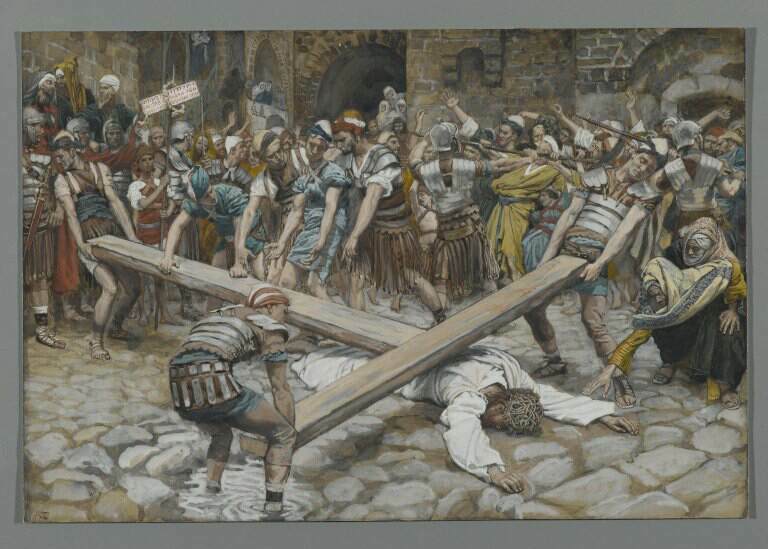 We see His Life poured out for us, only saving a few drops for when the lance would pierce His Heart on the Cross. Let us receive the Blood of Christ and ask for it to “be upon us” since we know that this Blood is the means by which we are redeemed that paid the price for our salvation. 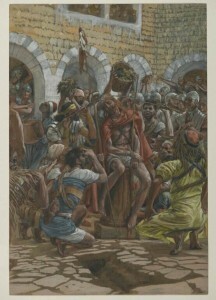 It is interesting that in this Mystery of the Crowning with Thorns, that instead of being called the “mockery” it is called the “crowning.” This focus on the crowning is, to me, a consolation in the middle of the Sorrowful Mysteries, a reminder that it is not for nothing that Jesus is suffering, and that His Kingdom is in Heaven. This Mystery reminds me that the Sacred Head that deserved the finest crown decked with every kind of gem and jewel- though it first received a crown of painful thorns- would eventually receive that resplendent crown after the Ascension. As many of us have endured the seeming failure of leaving religious life, we might put on a chapel veil, hat, baseball cap, etc. and mourn at the fact that there is no long beautiful veil there. These head coverings mock us. There is something special about the head and head coverings all throughout history and in most world religions. It signifies identity and belonging. As people of faith, we wish to bear an outward sign of what we belong to, of who we belong to. Jesus, though, reveals something powerful in this Mystery. He unites Himself to us in his suffering and mockery, in being crowned by something that does not correspond to His true dignity as the Son of God. But more importantly He shows us the foreshadowing of what would soon occur when the Son of God Ascends to His Father’s Right Hand, and is crowned in splendor and glory. We too possess a share in His dignity, as sons and daughters of God, and even if we never get to wear that veil with which we so desired to be adorned in Religious Life, we already bear in our souls the sign of our identity in Christ. How we love also reveals the One to whom we belong. And one day, God-willing, we will all be crowned in Heaven as we are received as co-heirs with Christ in the Heavenly Kingdom. This might sound odd coming from a former religious sister, but my least favorite time of year is Lent. I know that there are some people who love Lent, but I am not quite there yet! I wish I could say that I love praying the Way of the Cross…but it’s always hard for me. Newsflash: suffering is hard! Part of this difficulty is feeling incapable of doing anything to console Jesus in His Suffering. Am I just supposed to watch Him die because of my sins? I want to stop them from killing Him, but it has already happened. I think what Jesus wants in these periods of meditation and reflection on the journey to Calvary, is for us to insert ourselves in the story. We can participate actively in prayer, by helping to carry the Cross like Simon, by caring for Him like Veronica, by weeping like the Women of Jerusalem, by staying with Him like John, and (the prime example) by suffering with Him like Mary. When we enter this rather dismal scene we can experience make acts of faith and hope with those who followed Him. We can receive the love that would later be poured out for us on the Cross, cleansing us and making us worthy of Him. May this Mystery of the Rosary be for us an encouragement for all of us who seek to follow the Lord, because we have many examples in this passage of Scripture where we see how others have ministered to the Lord in His Via Crucis. 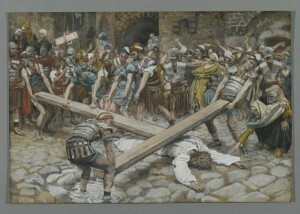 Here we gain insight on how we are to follow the Lord in our Cross in imitation of Him. As a college student and even in the Convent there was a hype about a book called, The Five Love Languages. There is a lot of truth to this, but I couldn’t help but roll my eyes sometimes… really? In the Convent? What it taught me is how I desire love, how I can love, and how Jesus fulfills in a perfect way all of these modes of loving. He serves, affirms, gives gifts, touches us, and LOVES spending quality time with us. But the one language that I am most struck by is Sign Language. My parish has a sign language interpreter, and although I know very few signs I do know one: Jesus. 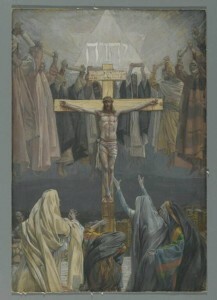 What is the “sign?” It is the touching on the palm of each hand with the opposite hand where the nail marks of the crucifixion are. This sums up who Jesus is to us- He is the one who suffered and died for love of us, who bore the marks of crucifixion and bears them even now in Heaven! This is the ultimate love language, as well as the 5th Sorrowful Mystery of the Rosary. As we meditate on this mystery we ponder the Suffering of Our Lord, not with despair or guilt, but with gratitude for our Savior and faith that our wounds may also be glorified in Heaven. There will be no shame or sorrow or regret but the delicious aftertaste of suffering, the fruit of perseverance, the reward for our faith in the midst of trial. May we love God in the unique and particular way in which we were created, and may we imitate Him, so that in Heaven the “sign” for each of us is our suffering and woundedness glorified by the One who has saved and redeemed us and given us the grace to endure all things.